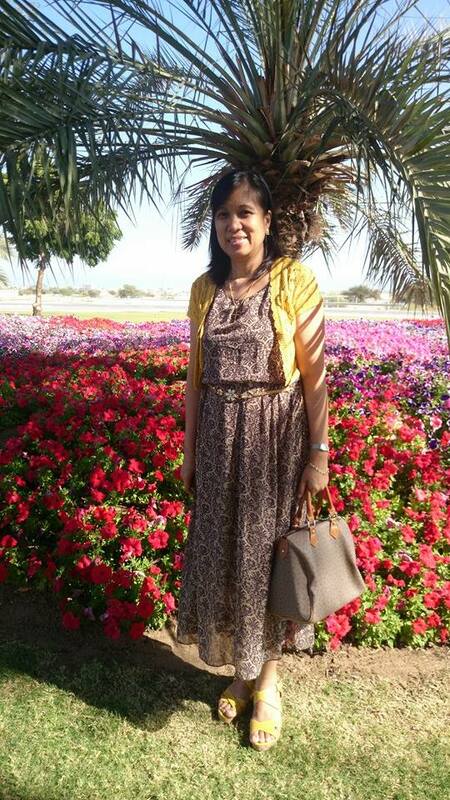 Every time I come back to the Philippines and people asked me where I went for summer and I tell them that I came from Oman, a majority of the people ask me where it is. Usually. it's "Is that in Saudi?" Or "Is that in Dubai?" So I answer (pun intended) with, "Oh-man is northeast of Yeah-men". I know, that's corny. 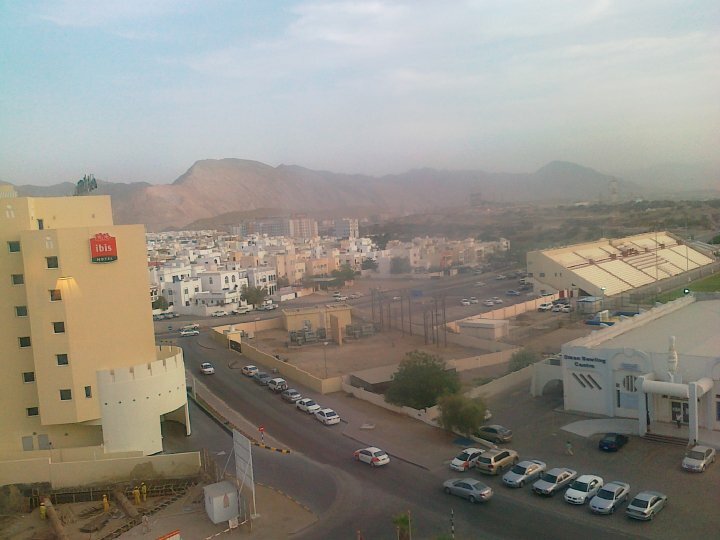 Oman is an Arab country bordered by the United Arab Emirates, Saudi Arabia and Yemen. It's an absolute monarchy ruled by Sultan Qaboos bin Said. It has oil reserves, ranking 25th in the world and is categorized as a high-income economy. I'm a daughter of an OFW. My dad has been in the gulf for thirty-six years (ten in the Kingdom of Saudi Arabia and twenty-six in the Sultanate of Oman). He speaks better Arabic than Filipino. When I was in my last year in college taking up Hotel and Restaurant Management, we were required to do an internship in a hotel or airline of our choice. I did mine in Oman because it was cheaper for us. Really! My dad works for the national carrier, so until when we were twenty-one years of age, we got ninety percent discount on airfare. We only spend something like PHP 5,000 for a roundtrip ticket, and since my dad already has a flat there, that saves us from renting an extra apartment. I walked to and from work, ate my meals at the hotel's staff house, and practically didn't need money except for phone cards. The advantage over here was when I went there last 2008, I remember sending Papa an SMS during my stopover at Dubai telling him to pick me up at the nearest possible point upon arrival in Muscat, which he said yes to. True to his word, I found him waiting for me down the stairs outside the plane.Hahaha! 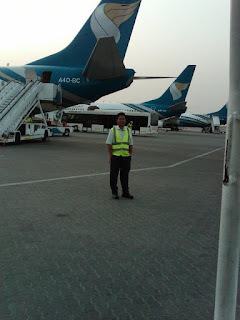 Papa at the Muscat International Airport with the flagship fleet behind him, Oman Air. 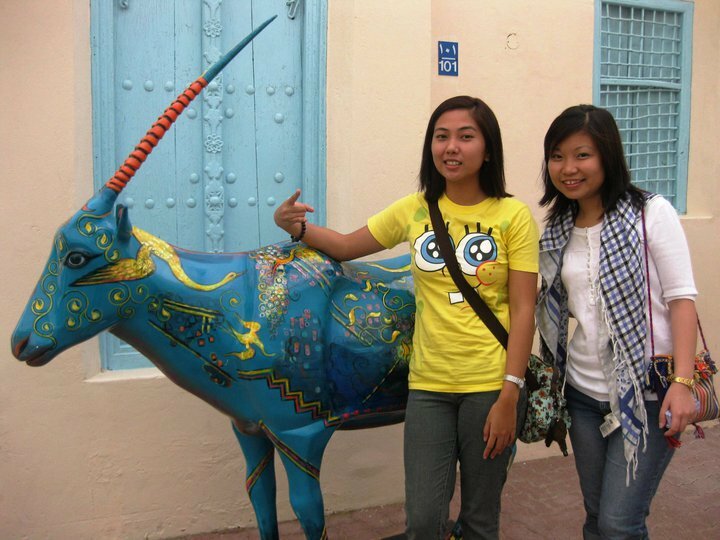 My sister and I used to spend childhood summers in Oman. 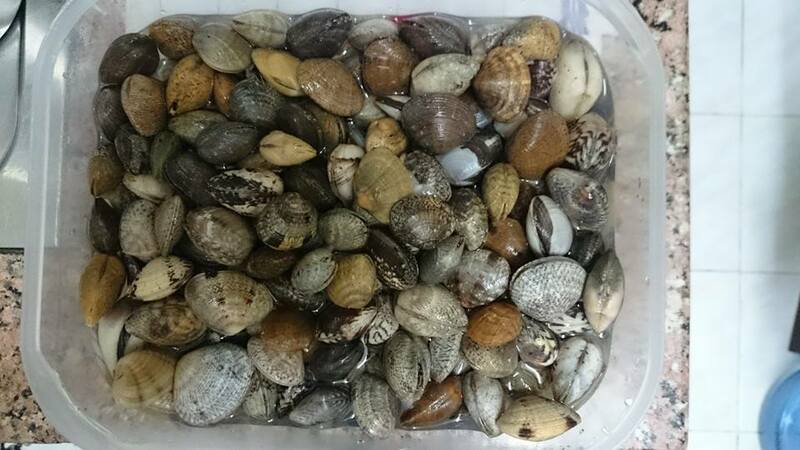 We feasted on Galaxy chocolates, Nesquik, roasted chicken and paratha, watching basketball, eating chicken shawarma, having family dinners at Omar Khayyam and feasting on pancit malutong, going to the beach and picking up fresh crabs and digging for clams. Shawarma places like these are everywhere. You can get a large one for around PHP 100, plus they serve free mint tea. But they don't have service water. 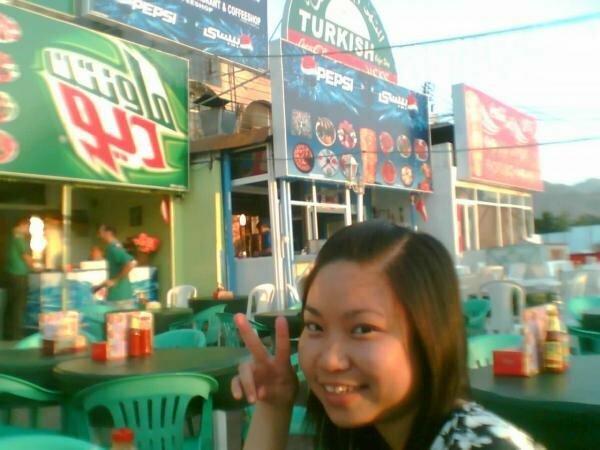 Istanboly is my favorite shawarma shop. My parents still bring some home every year. Unlike how others depict the Middle East with hot scorching sun, "winter" months are actually quite lovely. One night, it was too cold, my breath was foggy, and on some days, I had to wear a jacket and scarf during noon. The sun also sets a little later. Sometimes, at 6PM it would still be bright. We do get rain a lot of rain before and after winter. Sometimes, there's also snow in the mountains and they're accessible, so hurray! I loved the Sultanate for its clean highways and safe surroundings. The buildings were neutral in color and were low, often up to the 5th floor only. The colors of both buildings and villas are neutral, varying from white, brown, beige and the like. I lived with my dad who rented out extra rooms to other Filipinos. That's kind of a norm. Properties don't have security personnel by the door. Seriously, I never saw a security guard posted by the door of the nearby Oman International Bank that had gold plated doors! I'm not sure why some people hang out at the roundabouts, but hey! It's clean. The streets are clean because there are large garbage bins in every block, which are regularly emptied. I do have to commend how they recycle plastics into small pellets that are sold to plastic manufacturers so they can turn them into plastic stuff again. Even sewage water is recycled to water the plants in public areas through sprinklers. The taxis aren't metered, so you need to haggle well. The overpass has inclined planes instead of stairs. There is an abundance of date trees. Literally, most of the trees you will find in my photos are dates. The roundabouts and sidewalks are decorated with flowers and they are changed every season. Mosques are everywhere and they are beautiful. 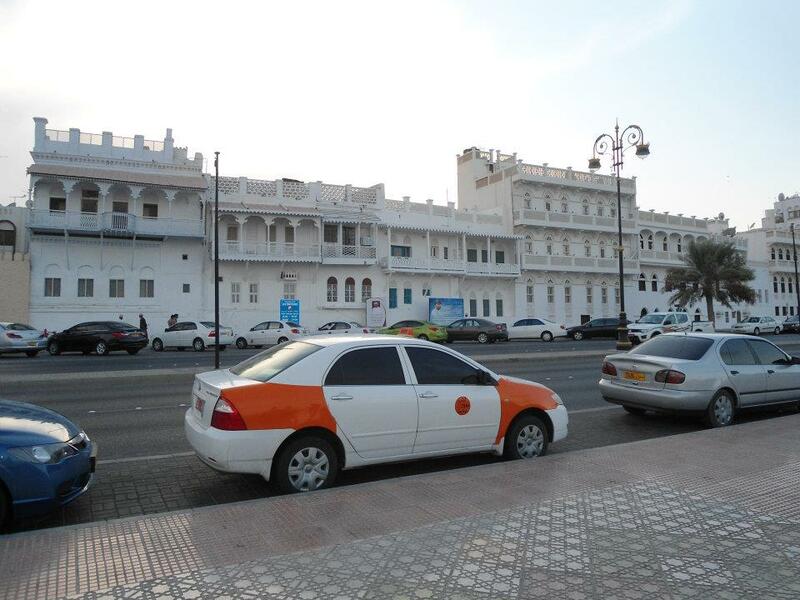 Taxi in Oman. They're all painted the same way. Often, locals only drive part-time. A taxi friend of mine actually owns a building that he leases out and then another who works for a petroleum company. O heavy traffic, where forth art thou? Nah! The weekends were Thursdays and Fridays. It has been changed to Fridays and Saturdays last 2013. Friday was the usual day-off of the working class, and it's also the day Christians go to church. Other religions are welcome. The biggest Mosque in Oman is called the Sultan Qaboos Grand Mosque. Greetings are long. My father and I met my local best friend and colleague outside the hotel one time and they talked for some time. When I asked my father what they spoke about, he said they just greeted each other. My Omani best friend, Mohammed. He's camera shy. On a good note, isn't that such a beautiful greeting to say "Peace be with you", instead of the usual "Hello"? There's an abundance of chicken dishes, and lamb dishes are cheap. Pork is limited, and it's quite expensive. Milk is always fresh, and so are the juices. Even if you don't open the bottle, it will still expire after four days. Eggplants are round. Melons are sweeter than ours, and the herbs are very cheap. One can even buy them by sack. There are real sharks in the fish market, and caviar costs less than five hundred bucks. 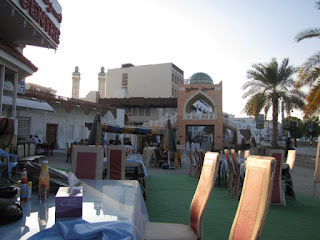 Bin Ateeq, one of the well-known authentic Omani restaurants. :) DIning areas are typically on the floor. There are many mountains and they're made of rocks. The beaches are mostly free. We spent a lot of time walking. Papa and I used to walk along the shore for 10km. You can pick up shellfishes and go fishing and crabbing. We used to go boating, and when I was young, we saw a rock islet with a staff in the middle. Papa said it was Moses' staff. I still don't know if he's joking. I'll post the photo here once I find it in our album. 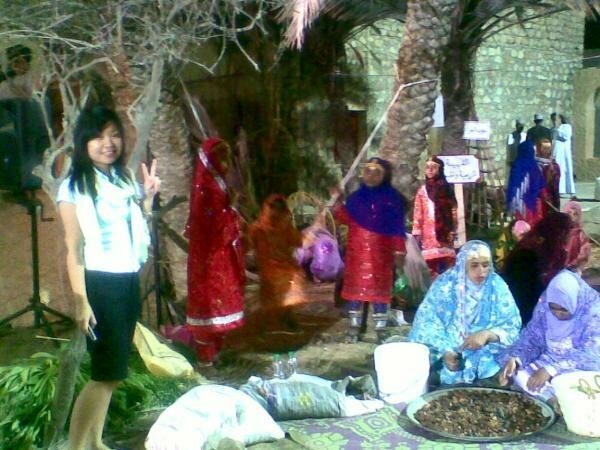 Every February, Muscat Festival is held in different places in the governorate. 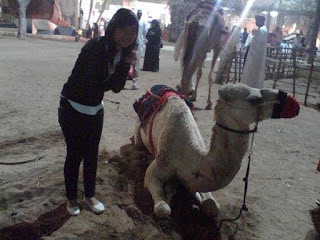 In 2009, I attended my first and rode a camel (also for the first time). 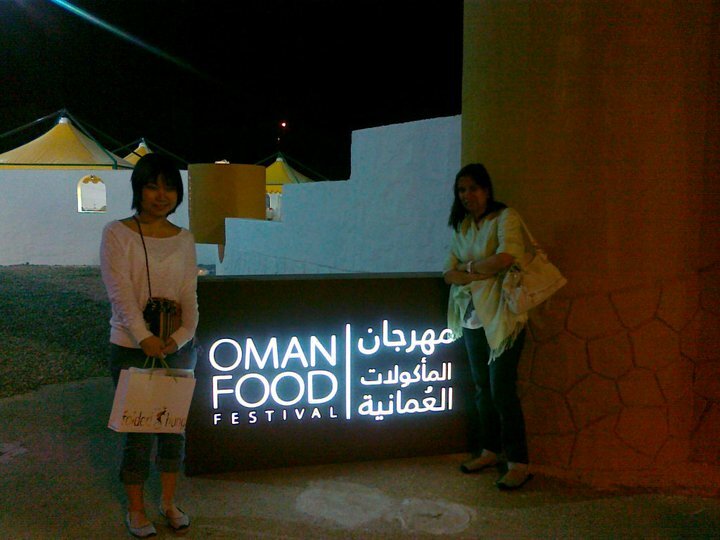 I had become a regular of the festival for the next three years. This was my first camel! Omani women in their colorful national costume. Yes, it's not the black dress. 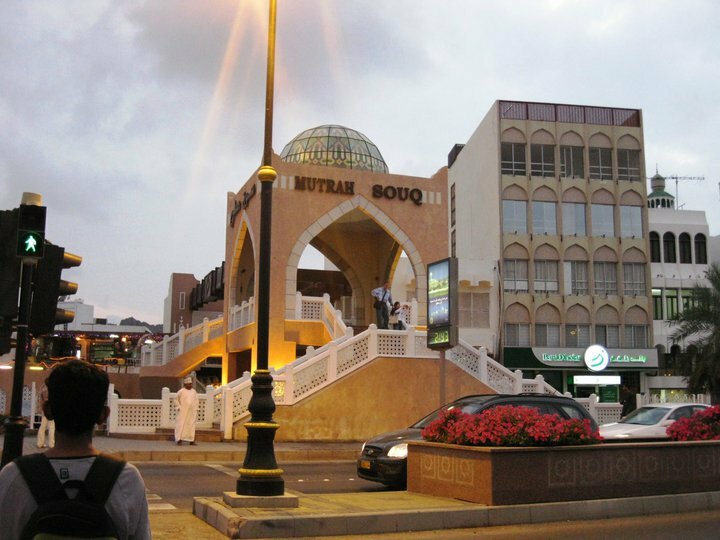 Old Muscat is where the Mutrah Souq, Fish Market, Corniche, one of the Sultan's palaces and a couple of museums are located. 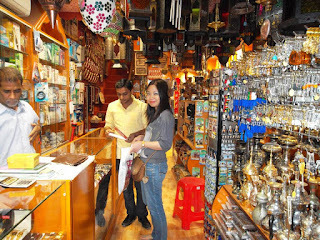 The souq is a flea market where you can buy souvenirs. 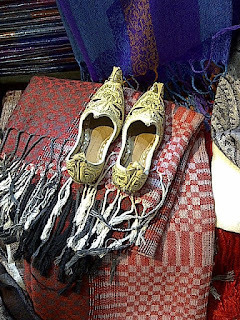 They sell pashminas, perfume oil, frankincense, footwear, shirts, khanjar (traditional dagger), even silver and gold by the weight. At the entrance, usually, sits a local who sells kahwa, a traditional Omani coffee with a hint of cardamom. Seated at Fast Food N Juice Centre outside the souq. Really, shop names are often generic. Image courtesy of Patrick Ong. 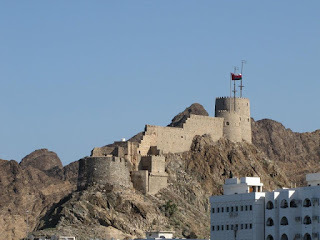 A fort in Old Muscat. Photo credits to Patrick Ong. My childhood friend and I visited Bait Al Zubair Museum. It's the same museum where my sister had her painting exhibited. 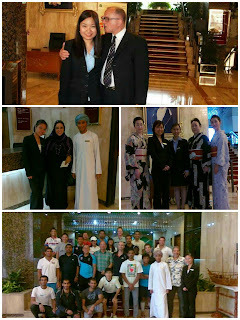 I've worked for Hotel Muscat Holiday from 2009 to 2012. They absorbed me into the company after the internship. I have worked with and met wonderful people throughout my stay. 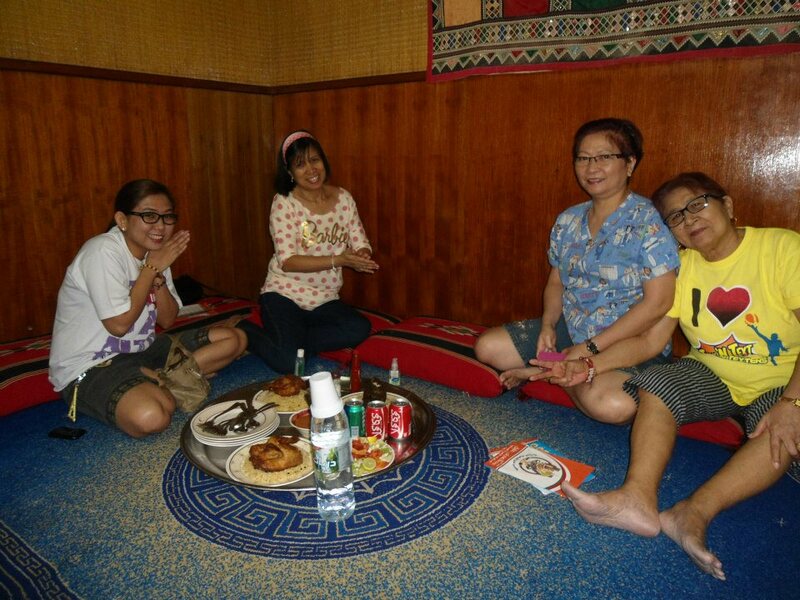 There were fellow kababayans, Omanis, Egyptians, Indians, Pakistanis, Sri Lankans, Tunisians, Syrians and Moroccans. 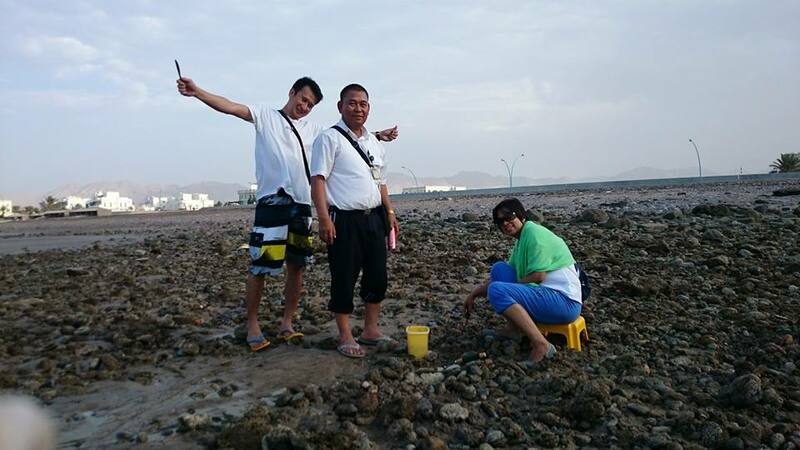 What I loved about working in Oman was that it was tax-free and we had good health benefits provided by the company. We were also given free accommodation, food (5x a day), and basic utilities (electricty and water). The staff house was just across the street. If you wish to live outside the staff house or if the company doesn't have one, they provide housing and transportation allowance. What I loved the most were the friends I made. Closest to my heart were the Dutch, German and Turkish friends I met. We still talk, except for the German guest as he had already passed away, but I became friends with his children. He was like a father to me, so I was really brokenhearted when he left. From top L-R: Sir Karl, my father figure and a rather silly one, too; a radio personality in Oman; Japanese cultural performers; Muscat Asian Beach Games 2010 Triathlon participants. There were Filipinos and they performed so well. One of my most loved trip in Oman, though, was when I went to the Wahiba Sands. 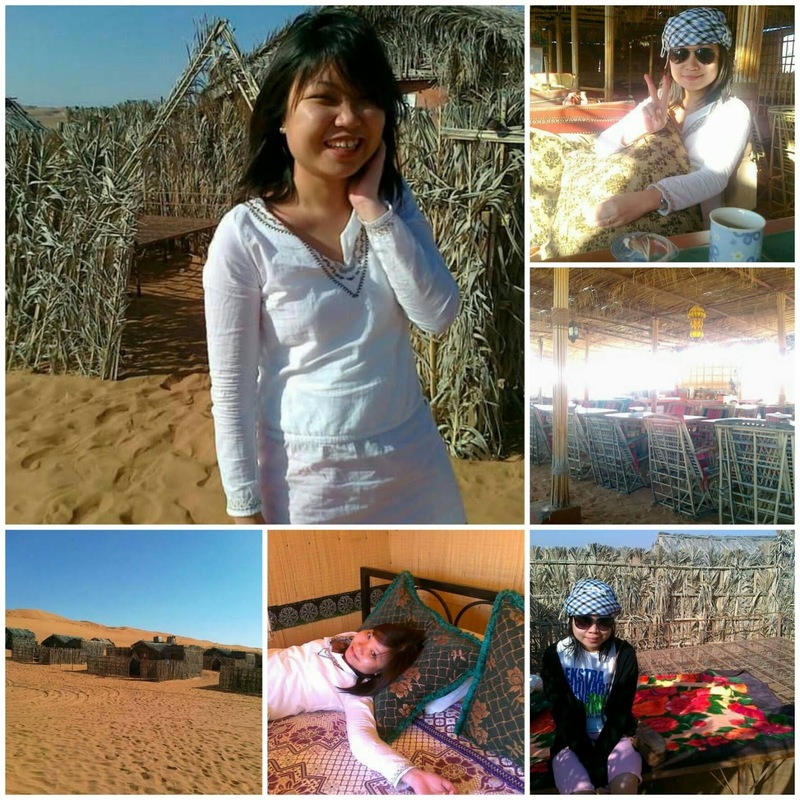 What's a stay in Oman without a trip to the desert, yeah? I was picked up by a 4WD in a small hotel near the place. It was quite a drive into the desert. Then I joined a family for the dune bashing, which was quite exhilarating. It's like riding a rollercoaster. I wish I could have saved the video. It was chilly in the desert, colder than the city. For OMR 25, I was able to get a hut with en suite toilet and bath and buffet breakfast and dinner. They place a bed outside your hut, too, in case you want to sleep under the stars. :) Tea and coffee were unlimited. They provided traditional entertainment during the night plus sisha. There were also some camels (which I tried again) the next day that you can rent for a 15-30min ride, and local Omani ladies selling handcrafted items and doing henna tattoo. The camp also offered sandboarding for free. I was so bad at it that I didn't bother getting a photo. I'm still hoping I could come back here soon with my boys, even for a short vacation. I just would love to show them the country I have grown to love through childhood summers. For more information about Oman, you may visit http://www.omantourism.gov.om. What an enlightening post about Oman. Thank you for the virtual tour :). Ang saya lang ng joke about Oman and Yemen haha. Honestly, before your post, I also have no idea san sya banda, basta alam ko Arab country sya. Ang saya naman ng 90% off sa airfare. Sana nga forevs yung discount. Hahaha! Kapag spouse free until retirement/resignation. I'm one of those people who have no idea about Oman so thanks for this post. Your post reminds me of my friend who always go to Saudi every summer and sembreak because his family works and lives there too. 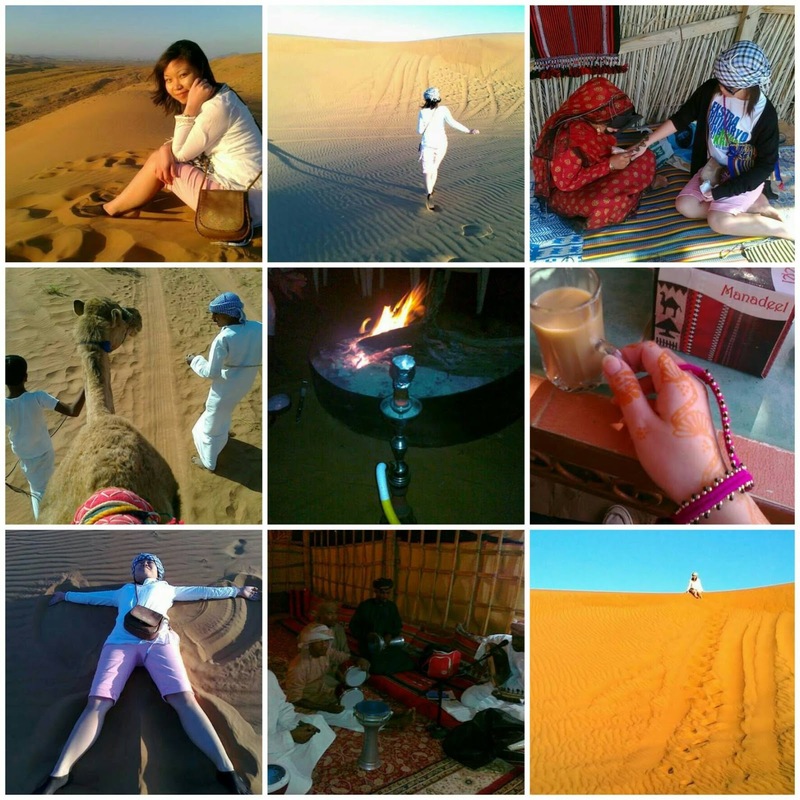 This is quite a lovely read about Oman. Honestly, I do not know so much about this somewhat obscure country. Thank you for piquing my interest about the place and for the tour. It is very interesting to visit a foreign country when you are young and see how it varies from your own. I thought it is such a life-enriching experience. I sure hope I can bring my little man to Oman, or somewhere overseas, one of these days. Your Oman post reminds me of my childhood spent in Jeddah. Maybe I should travel to Oman when opportunity presents itself. Wow, ang linis pala ng Oman. I know it's a rich country as I read about it a couple of years ago when my sister said she might work in Oman. Is your Papa still there? You xan surely ask him to take you and the kids so they can also experience the fun and precious moments you had when you were younger. 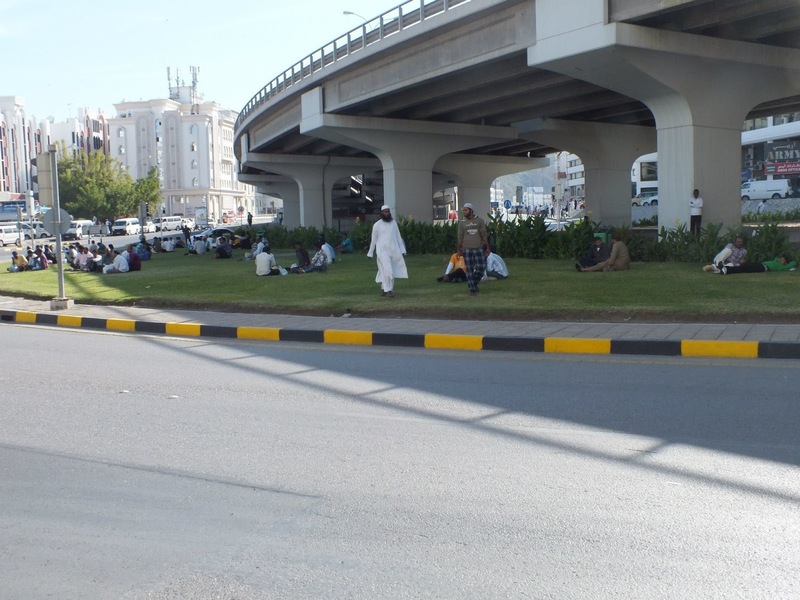 Such a long post but thank you for doing so I learned something about this country Oman. I wish that here in the Philippines getting a driver's license will not be that easy too. This is to avoid more cars on the street and accidents made from reckless driving. Wow! I sure learned a lot from this post! I'm poor with geography and have no idea where Oman is. I would have answered Dubai or Kuwait when asked. Hehe. Love that there's no traffic there! I wish it's the same here. Haha! I had a classmate before who was from Oman. Besides its capital, I didn't know much about it. It looks like a great place to spend the summer. Looks like you really enjoyed being there. Wow! From zero interest to Oman, my interest in visiting it went up 50 notches! Oman sounds like a really nice place and it sounds like you had such a great time there. Oman seems to be a lovely and enchanting place. I know a lot of acquaintances working there. 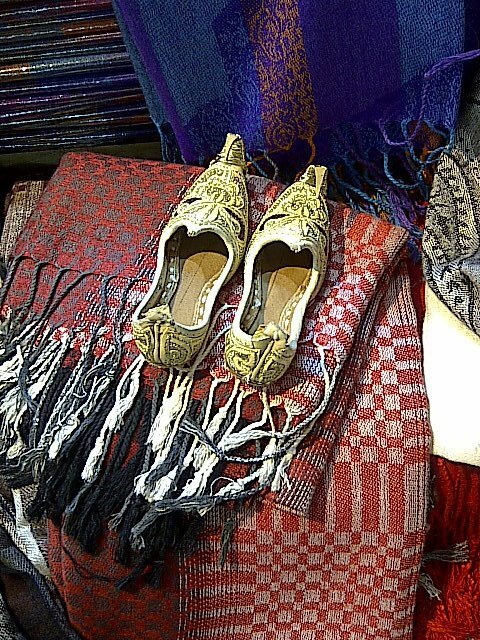 I would love to take home that jasmine shoes if i will be given the chance to visit Oman! You gave us a picture of a clean (real clean) and peaceful Oman. I always imagine Middle East countries as war zone for reasons I don't know. Makes me want to visit the place as well and eat all the Shawarma I could see. I lovd shawarma kasi. Ehehehe. It's common to think of mideast as war-torn. Honestly, we got affected, economically speaking, nung Arab Spring. 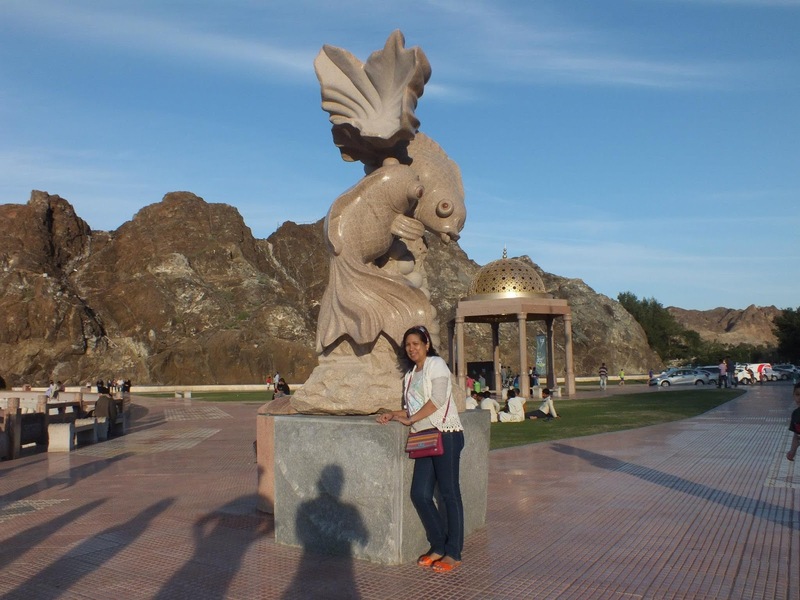 Tourists thought magulo din in Oman. Pero it had always been peaceful kahit magulo yung neighboring countries. Naku Mummy Berlin, sabi rin ni hubsband pag pumunta kami dun araw araw sya kakain ng shawarma. Hahahaa! 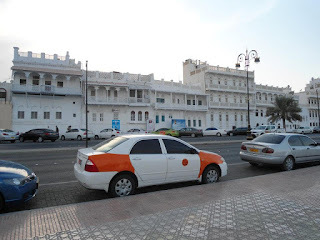 Thanks to your post, I learned lots of things about Oman. Oman seems like an interesting place to visit. the joke didn't "LOL" me but it made me smile, for I found it witty. Its nice to read travel blogs that talks so much about a country's culture and heritage & nice places to visit and dine. Never been there but it sure does look super clean. I love this! Gives me a good picture of Oman and actually makes me want to add Oman to my list of places to explore with my children. Would love them to experience saying "peace be with you" to others. I love that! Wow! Reading your post feels like I'm in Oman. Thank you! My cousin who used to work there likes the country too. Aside from it's tax-free, they have accommodation and transportation allowance. 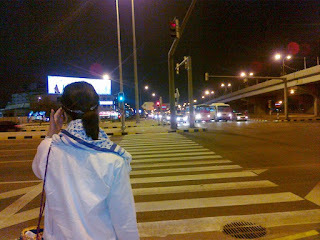 How I wish we have those wide roads here in the Philippines and the place is very clean. Not really that aware where Oman is, so your post really helped cleared that up. It also helped depict the place in such a wonderful light. Makes me want to visit especially because it looks clean! Never knew these things about Oman. I had a neighbor who used to be an OFW there but I was still a child then so wasn't really able to ask him about the place. So awesome that you were able to really experience what the country has to offer. Oman seems to be a very lovely country based on your descriptions. There are lots of places to see and things to do. I look forward to visiting this place, too. 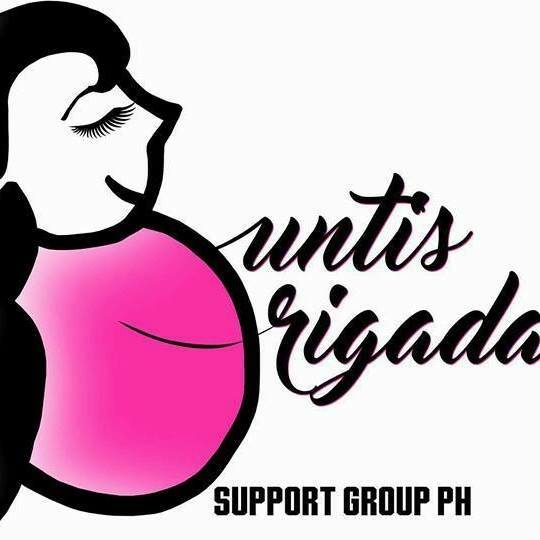 I enjoyed reading your blog and ang daming matutunan. It's obvious that you love the place. Keep blogging and update us with your adventures there. Assalamalaykum! 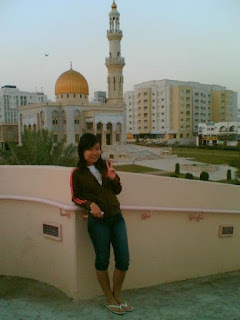 Tbh, this is the first time I had a glimpse of Oman. Its a beautiful country pala. How are they when it comes to treating women? 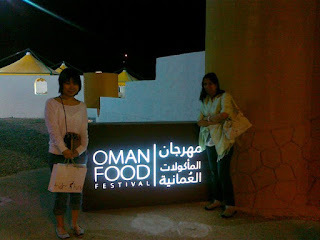 Nice to see and get to know Oman from you. My cousin works there but we are not talking about it when he is here in the Philippines. Are they also not allowed to eat meat of a certain animal because it's sacred for them? 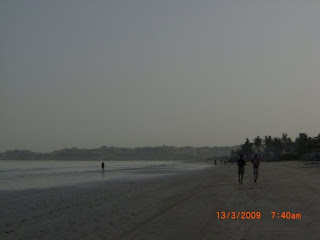 With your descriptions it seems like Oman is one good place to go to.